“What a fish,” gasped the man as he laughed in astonishment. His weary eyes embellished every inch of it. It was foamy white like the crest of the waves. It’s tail dissolved into darker shades of blue, with the tip as dark as midnight. 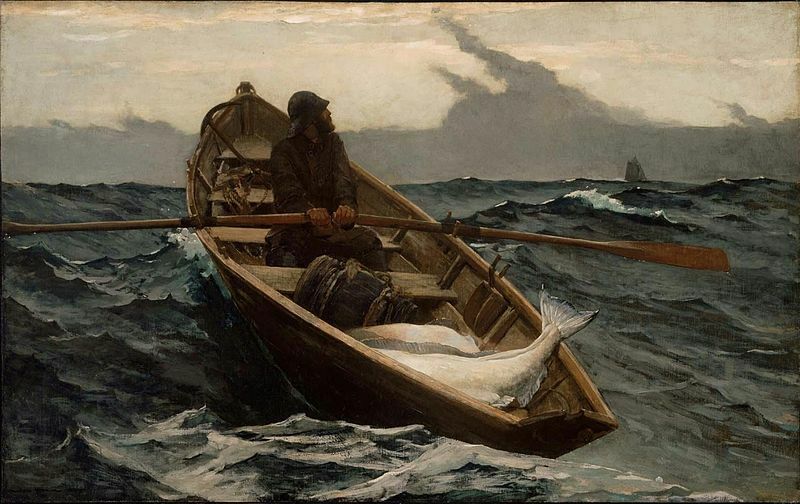 The fish’s head was tucked down deep into the middle of the boat, in front of the one he had caught just hours before, and its tail lay upon the edge of the man’s small boat, that was just barely wider than a canoe, from where he had drug it up onto the boat. It was a wonder he had gotten it in as far as he had. The fish was a massive halibut, as heavy as the man himself. It tested the integrity of the boat, but the man didn’t once fret. He knew his boat could handle it, and the worn edges showed that it had stood tall against the harsh, salty water for years. He turned his head to look out on the water, paddling his oars through the rough, dark waves. They were thick, heavy waves, and they were rolling up from much deeper waters, making the surface rock with intense layers of blue, green, and black. His arms grew weary as they fought through the molasses of the ocean. The waves rocked his boat up high on both ends, and the man shifted his weight with each rock, balancing himself as the boat came to an almost upright position. He lifted his eyes to the horizon and spotted his ship, now several hundred yards away. With every paddle, he felt as if the waves pushed him back to his original place, and he was rocking back and forth in one spot. He recalled the long battle with the fish, a battle that must’ve spanned a very large area. After all, it was the fish’s domain. The man had no choice but to follow it wherever it chose to run, no matter how far. Now, it was clear just how far he had gone. The ship was visible, but its size could no longer be vividly determined, as it was just too far out of sight. Just then, he felt a cool, heavy breeze so thick that he wiped his neck thinking there was water on it. He looked up and saw a massive cloud of dark, gray fog descending on the water. The deep, cold water had brought the freezing depths of the ocean floor with it to the surface, and now the fog was a clear representation of its presence. He looked back over at the ship, and noticed it was slightly more cloudy than before. He could now see the fog passing in front of it. Parts of it hid behind the fog, then reappeared as before. At every moment, he inhaled the chilling air and held his breath, hoping that it would reappear, until finally, it disappeared for good. He looked back at the fish. Each one was several hundred pounds, more than enough to slow his boat down to the point of near impossibility of travel. The travel before his catches was much more simple, however, the water had also been much calmer and less dense. He compared the two. One was clearly larger than the other, the more recent of the two. The man grimaced as he looked at them. Finally, he started to paddle again, immediately being met with intense opposition. He stopped to feel the waves, and he patterned his movements according to them. He fought as if he was finally making progress, although it wasn’t clear whether he was or not. He fought this way for a great deal of time. His arms, already worn from bringing in the fish, cramped and seized as he pushed them to their limit, and even past. His muscles ached, and he could feel inner parts of his arms stripping with sharp, jolting pain. He looked out at the horizon again, but the boat was now completely out of sight, hidden in the fog. In fact, the fog was so thick, it was hard to to even see the water around him, much less the distance he had traveled. The larger of the fish was even hard to make out, and the other was hidden underneath the larger one’s shadow. As far as the man could see, he was now lost in an empty boat in the middle of the ocean. He looked at the fish intently, straining through the fog to make out each one’s frame. He inched forward, and saw them more clearly, still where they had been before. He moved closer to them, feeling the weight of the boat now dominantly on that side. He jolted back, rebalancing the boat. He leaned over sideways, with his feet on one end, and his torso on the other with the fish. He slid his hands underneath one of them, the larger of the two, and lifted it as well as he could, feeling its massive body once again. He scoffed at himself as his mind raced with thoughts. Finally, with one mighty effort, he swung it onto the edge, rocking the boat intently to that side. He grabbed its tail and lifted it up high above the edge, and he watched as it slid off his boat out of his hands and into the water. The boat rebalanced itself, and he felt the lightness of it now. It was surely a few hundred pounds lighter now, and it cut through the water much more valiantly, even with the other fish still in it. The man sat back up and grabbed the oars, slicing through the water with much more success now. He looked at the fish that remained, and shook his head at the loss of the other. Just then, his boat crashed into something behind him, throwing him forward to the opposite edge of the boat. He looked up behind him, and there, through the thick fog, he recognized the massive vessel he had slammed into. It was his very own ship.